Many short and stocky people feel frustration when shopping for clothes that flatter their bodies. Clothes are often designed for taller, thinner people and the proportions don't work well on stockier bodies. If shorter women and men try to create long lines with their pants and tailor their clothes to fit properly, they can be happier and feel more at ease with their bodies. When choosing dresses or skirts, hem length is particularly important for women who are short and stocky. Try on dresses or skirts before buying them to make sure that the hem length is flattering and does not make your legs look shorter. Usually a hem that sits either at or slightly above the knee works best. When selecting dresses, choose an a-line silhouette over tight- or drop-wasted dresses, which will only emphasize your stockiness. Avoid prints that are too large, because they will overwhelm the size of your frame. 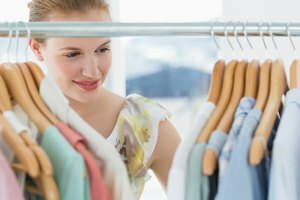 When buying any style of women's clothing, shop in the petite section of department stores. Unlike misses sizes, which are smaller all-around, petite sizing is made for shorter women who have womanly proportions. When putting together an outfit with pants, pay attention to proportion and the width of the pants. Try to create straight lines that extend from your hip down to your toes with wide-legged pants that neither taper nor flare at the ankle. Avoid jackets that are boxy in shape or add extra bulk to your body. When possible, dress in a monochromatic color scheme; a single color can give the illusion of elongating your body. A good fit is the key to flattering a short and stocky body, so don't hesitate to get your clothing professionally tailored if you cannot find a good fit off the rack. Many short and stocky women don't think about the effect accessories have on their overall look. 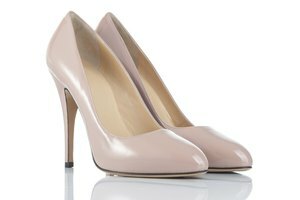 Shoes are particularly important for women who wish to appear leaner and taller. Choose shoes that are the same color as your pants to make your legs look longer. High heels often make a shorter woman seem taller, though some outfits look more balanced with flats. Avoid shoes with ankle straps, because they can make you look stockier. Also avoid large belts and bags that can overwhelm and dwarf your body. Shorter and stockier men also must dress appropriately for their body type. Like women, men should try to create the appearance of a long vertical line when dressing. This is best achieved with a well-tailored suit. Light pin-stripes will help make you look taller. Avoid bulky or double-breasted jackets that will emphasize your stockiness. Choose neckties that are short and slim to balance the proportions of your body. When dressing casually, stick to slim-fitting jeans and avoid sweaters that have cables or any extra bulk.